You're done with optical discs as a means of data and media delivery, or soon will be. But when done right, as it has been with Millenniata's M-Disc, optical has a particular advantage—longevity. Hard disk mechanisms fail, and the data stored on them can be erased by magnetic fields. Tape stretches and is also magnetically vulnerable. NAND won’t last forever, because cells leak and eventually fail. That leaves M-Disc looking pretty good in the media preservation, aka archiving role. In the enterprise, optical has enjoyed continued success. Companies such as Sony and Panasonic have continued development both because of its longevity and the minimal environmental support it requires. You think your hard drive generates a lot of heat? Try operating thousands of them. AC bills can be rather high. 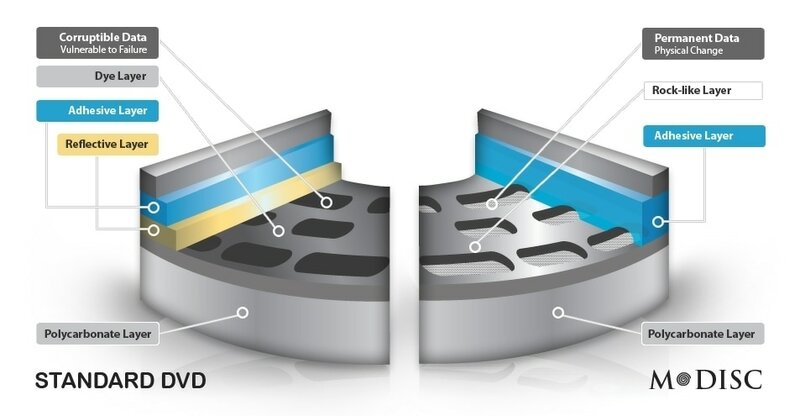 This diagram illustrates the difference between dye-based and inorganic recordable optical discs. The advent of relatively unstable, dye-based CD/DVD recordable and rewritable, as well as the lack of quality standards governing them, caused many users to forget that pressed optical discs are very long-lived. CDs from the 80’s and 90’s should still play fine, assuming you haven’t scratched them up. Same deal with DVD and Blu-ray moves, which are manufactured similarly. And, even though few are aware of it, write-once BD-R HTL (High to Low, i.e., reflectivity, as in bright to dark) is rated to last 100 to 150 years. Why? Because the data layer is a non-volatile substance, as opposed to the light-sensitive organic dye used in CD/DVD-Rx and less expensive BD-R LTH (Low To High, dark to bright). M-Disc also uses a non-volatile data layer, but an even better, rock-like one which is said to last ten times longer than BD-R HTL. If you can’t trust media that’s rated for 1,000 years, you’re pickier than I am. One note: Don’t freak out when you see an M-Disc DVD+R. It’s nearly transparent, but there is a data layer present. The only failure point for the material used in the M-Disc data layer is oxidation, which, according to Millenniata materials scientists, shouldn’t be an issue for about ten millennia. Yikes. The comparative delicacy of the polycarbonate outer layer of the disc is why the media lasts “only” a thousand years. I’m not going to live a thousand years, so the only thing I could test was compatibility. Millenniata was nice enough to send me an M-Disc-compatible optical writer, the Samsung/TSST SE-506CB.RSBD, for write testing. I also tried a vintage 2006 Plextor PX-B320SA, but it didn’t recognize the M-Disc BD-R media as legitimate media for writing. You should see a logo something like this on compatible DVD burners. As BD-R HTL was part of the Blu-ray standard, and M-Disc functions much the same way, any BD burner is physically capable of writing M-Disc BD media. But as my experience with the PX-B320SA proved, if the firmware doesn’t like it, it won’t work. The logo on the front of an optical burner is actually only for M-Disc DVDs, and then only for writing, as many non-logo drives will read it just fine. Laser strength must be increased beyond that normally used with CD/DVD R/RW to ablate the data layer in M-Disc DVDs, so compatible firmware must be in place. Older drives could be upgraded for writing, but as there’s little financial incentive, don’t hold your breath. The SE-506CB.RSBD burned flawlessly, so I took the discs it created and tried to read them using every drive I could find. M-Disc says its recordable DVDs should be readable in 90 percent of the DVD drives installed, or being sold now. I didn’t hit 90 percent, but even though recognition could be slow, the majority of the drives I tested read M-Disc just fine.